TEACH YOUR BABY ABOUT WILD ANIMALS: This adorable, plush, jungle animal toy set is the best way to introduce your precious little ones to the wonderful animals of the jungle! Complete with a plush carrier in the shape of a tree and four amazing, squeaky, stuffed animals, this play set is sure to keep your little baby entertained in between meal and nap times. Plus it's a great way to start teaching your little angel about the colors and sounds of these magnificent, wild animals. EXTRA DURABLE & SAFE FOR BABY PLAY: Made with top quality, long lasting materials under the strictest safety control standards, this darling play set is perfectly safe for babies and toddlers aged 1 month and up. 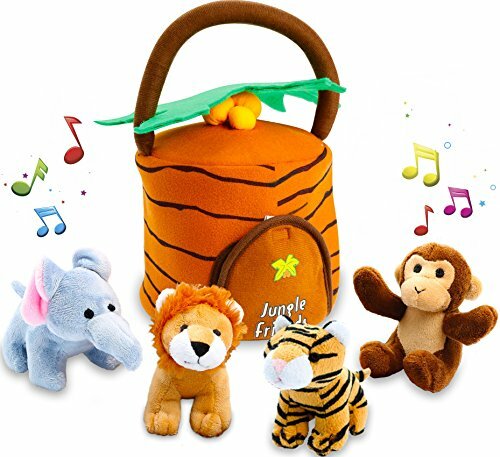 The set includes the jungle house, where animals sleep (6" L x 6" W x 10.5" H), a plush roaring tiger, a plush elephant that squeaks, a fun monkey with a boing sound and the king of the jungle, the wild lion (dimensions for all animals: 3.5" L x 1.9" W x 3.1" H). BUY RISK-FREE: Being so sure about the excellent quality and durability of these plush, jungle animal toys, we offer you a hassle-free, 1 year warranty of complete satisfaction. So what are you still waiting for? Order your safari animals play set now and let the fun begin! Click "Add to Cart" now!